Saving tomato seed is a little more complicated than the usual “dry and store” process for seed saving. Each tomato seed is encased in a gelatinous capsule that actually prevents the seeds from sprouting, and that capsule must be removed before the seeds will germinate. This is accomplished by putting the seeds through a fermentation process. First I choose the tomato. I always try to pick one of the best tomatoes from one of my best looking plants because hopefully those characteristics will be passed down through the seeds. I wait until the tomato is almost over ripe, then I remove the pulp and seeds and put both in a small container. Any small bowl or jar will work well. Usually, there will be enough juice in the tomato to completely cover the seeds and pulp in the bottom of the container. If there isn’t enough juice, I add a tiny bit of water to cover the seeds. I mash down the pulp with my fingers and stir the seeds into the juice. Then I cover the jar with a piece of dampened cheesecloth. Some people use a piece of plastic with holes punched in it… I like the cheesecloth because it gives better air circulation. Next the container of seeds needs to wait out the fermentation period in a warm place. In my house, that place is next to our large freezer’s ventilation grill. Sometimes I put seeds on the top of our dehumidifier… some people use the top of a refrigerator… anywhere that gives off a gentle warmth will be fine. Every day I remove the cheesecloth and stir the seed around in the liquid mixture. Then I re-moisten the cheesecloth, cover the container, and put the seeds back in their warm place. As the mixture ferments, the liquid will become a darker color and a foamy “scum” will form on the top. Within four or five days the fermentation will have dissolved the gel casing around the seeds. Don’t leave the seeds in the fermenting liquid longer than that because without the gel casing, they may start to sprout. Now the seeds need to be cleaned. 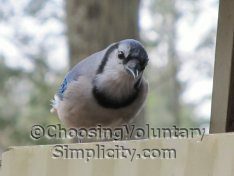 I use a fine sieve, dump in all the liquid and what is left of the pulp, and use my fingers to move the seeds around in the sieve while they rinse under cool running water. After all the pulp and fermentation residue has been washed away, I let the seeds drain in the sieve for a few minutes longer and then drain them further on paper towel. Finally I transfer the seeds to a dry piece of paper towel, spread them out with space between each seed, and leave them to dry. To help the seeds dry more evenly, I move them around on the paper towel occasionally… in about two weeks they will be dry. It is important not to hurry the drying process, because the seeds will mildew in storage unless they are completely dry. I store all my seeds in paper envelopes. I write the name of the tomato and any information I want to remember about that variety on the front of the envelope, and I store the envelopes in a large glass jar in the freezer. Using this method I have had seeds germinate well even after several years. Want to know an even easier way to get tomatoes from the seed of previous years tomato plants? Simply take the best looking tomato, from the best looking plant, wait for it to drop off naturally from the plant, and then pick it up, and drop it somewhere where it won’t be disturbed. For me, this is one corner of my glasshouse. Next year, providing it is getting some moisture during the correct season, you’ll find a whole bunch of seedlings popping up. Prick them out, and bingo. Saves a lot of hassle, and works perfectly. Thanks for this post. I am hoping to save my heirloom tomato seeds this year and didn’t know how to do it until I found you. 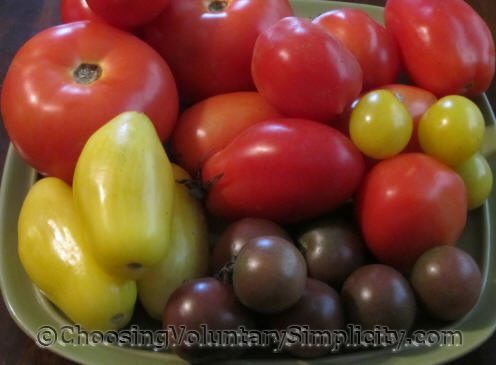 What are the little brown and long yellow tomatoes in the photo? The little brown tomatoes are called Chocolate. We grew several varieties this year… some were regular sized and some were cherry sized. They have a very nice flavor. The long yellow tomatoes are called Banana Legs. Growing up on a farm we always let our hogs prepare the tomato seeds for planting the next year. Our best tomato plants were always salvaged from the hog pen.